This was a week of milestones. Sunday was the two year anniversary of my maternal grandmother's passing. Thursday was my birthday. While I'm not one to usually look for signs from above, it seemed like more than just a coincidence when the bill for my birthday breakfast came back matching the last two digits of each of our birth years: hers the dollars and mine the cents. The chance pairing of those numbers stuck in my head and set the tone for the rest of my birthday. 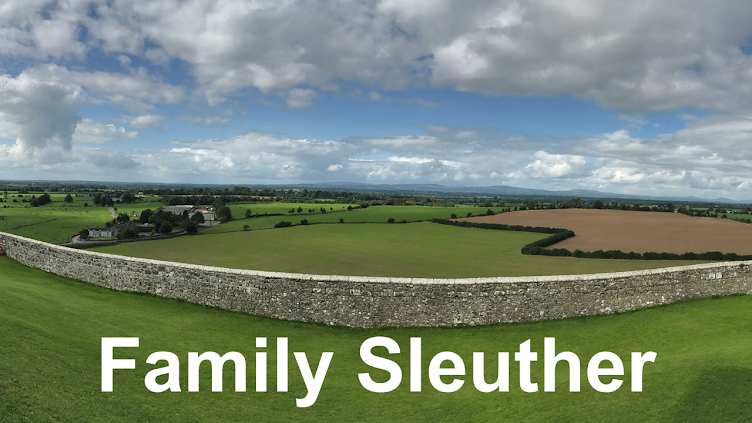 Readers of this blog know that I am researching my 5th great-grandfather Thomas Kirk. He represents a brick wall for my paternal line. I want to learn the identities of his parents and their ancestral origins. 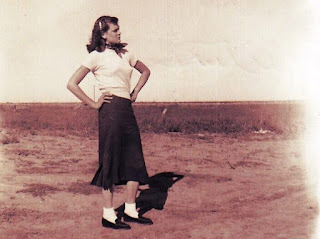 Given the spotty 18th century paper trail, I've turned to genetic genealogy. Thomas had a large family with at least twelve children. Seven of his children were sons who lived to adulthood and had sons of their own. 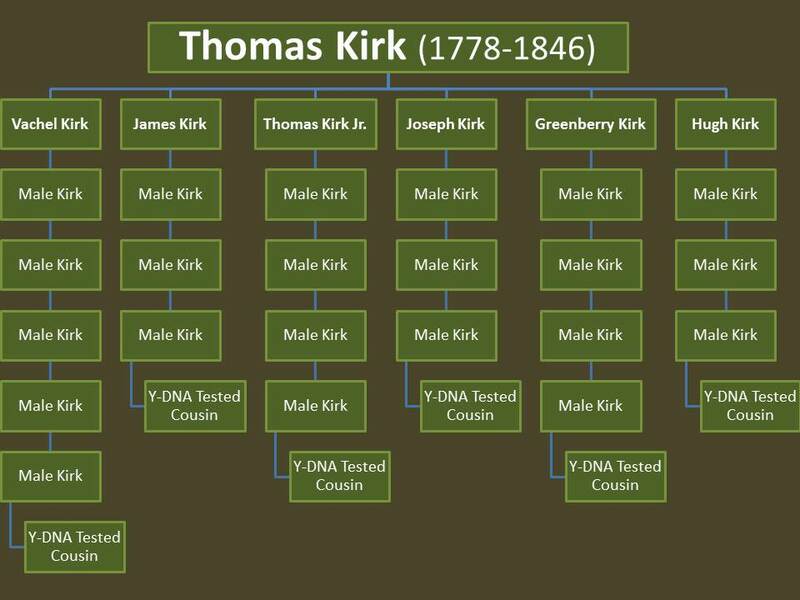 To accurately recreate Thomas' Y-DNA, I've been searching for male descendants of each of his seven sons. After months of research and outreach, four men - descendants of four of his seven sons - agreed to participate in the Y-DNA initiative and tested. However, I still wanted to find male testers descending from the remaining three sons. I had feelers out to several men. Stopping by the mailbox on my birthday, I saw there was a letter from a gentleman who was a descendant of one of those three remaining sons. He's not online and doesn't have an email address, so we've been corresponding about our shared Kirk ancestry through letters. I ripped open the envelope and pulled out his note: "Yes I would be willing to do a DNA test." I was ecstatic! Testing another descendant of one of Thomas' sons was a fantastic birthday present. I quickly loaded up the DNA website and ordered his kit. Five sons tested only two sons to go. When I logged into my own account, I saw that I had a new Y-DNA match. The match's surname was Kirk. I quickly recognized that the first name belonged to a gentleman I spoke with this past winter about testing. Months of radio silence later, here I was staring at another genetic match and, best of all, the descendant of one of the two remaining sons. 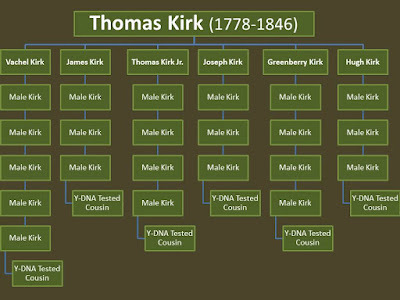 Chart of Y-DNA-tested descendants of Thomas Kirk's sons. What were the odds that two more men - much sought-after descendants of two of Thomas' sons - would both contribute to the Y-DNA research project on the same day? And my birthday to boot! It felt rather serendipitous. As a genealogist, I couldn't ask for a better gift, and I can't help but wonder if my grandmother had a hand in it. My focus is now on Thomas' last remaining son. William Kirk, you're next!